Who’s ready to indulge? 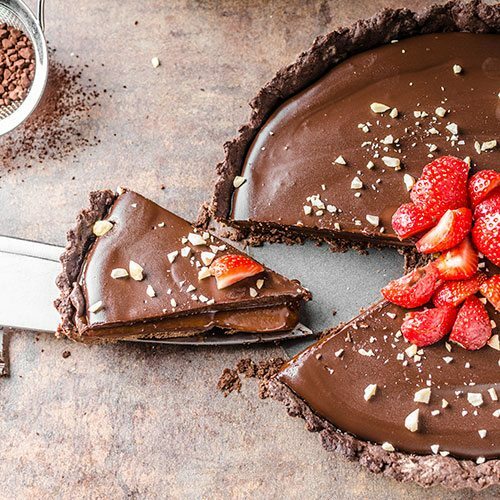 This delicious vegan chocolate and salted caramel tart ticks all the taste bud boxes! If you have pre-made shortcrust pastry, feel free to use that as the base; otherwise, we have provided a fuss-free pastry recipe as well. Top with your favourite nuts and fresh strawberries and dive in for a delicious treat! 1. Preheat oven to 180 degrees. Lightly grease a 22cm tart tin. 2. BaseWhisk flour, cacao and salt in a large bowl until combined. Add coconut oil in spoonful’s and use a fork to combine ingredients until it resembles crumbly wet sand. Add ice cold water 1 tbsp at a time, using enough to help it form dough. Knead gently with your hands in the bowl, then transfer to a lightly floured surface. Form a dough ball, then place and flatten between 2 sheets of baking paper. Using a rolling pin, roll out the base to roughly 3mm thick. Take the top baking paper off, then flip and drape over the tart tin gently. Remove the other sheet of baking paper, then use your fingertips to fill in any gaps. Bake for 10-20 minutes or until lightly browned. Remove and let cool. 3. FillingBlitz dates, coconut oil and vanilla until a thick paste. Add cream and salt, and blend again until smooth, scraping down the sides to get all mixture. Spread over the pastry base and freeze for 20-30 minutes. 4. ChocolateIn a heat-proof bowl over simmering water, melt coconut oil, agave syrup and vanilla. Stir, then add cacao, whisk until smooth. Pour over the caramel filling, spread with a spatula. Place in freezer for 10 minutes, then serve sprinkled with crushed nuts and strawberries.